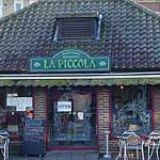 La Piccola Pizzeria is an Italian restaurant that serves a variety of popular traditional dishes. A take away menu is available, as is outside dining on the pavement area. 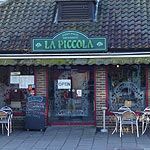 Do you work at La Piccola? What did you think of La Piccola? Overpriced, understaffed and cold atmosphere. Don't take my word for it, check it out yourself for a really disappointing rip off experience never to be repeated. This is surely one of Hammersmith's best kept secrets: simple, delicious Italian food at a very reasonable price. Whilst the location is not ideal and the exterior mildly off putting, it's more than made up for by the proprietor, Pino, who is always friendly and welcoming. Although serving not much beyond freshly prepared pizzas and pastas, these are both of the highest order. Excellent value for money.